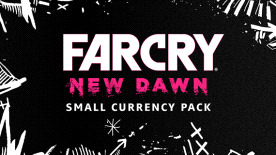 The Far Cry New Dawn Small Currency Pack contains 500 credits – a currency used to purchase extra items, outfits, consumables, and other new Far Cry® New Dawn content. Far Cry Credits are available in packs from Small (500) to XXL (7,250), and all packs Medium and higher include bonus credits. © 2019 Ubisoft Entertainment. All Rights Reserved. Far Cry, Ubisoft, and the Ubisoft logo are registered or unregistered trademarks of Ubisoft Entertainment in the US and/or other countries. Based on Crytek's original Far Cry directed by Cevat Yerli. Powered by Crytek's technology 'CryEngine'.